What a great architectural flourish at the top of the Park-McCullough carriage barn! 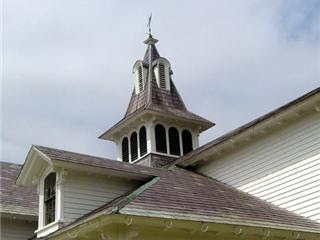 An amazing cupola - with all its roof angles and arched vents. It's also an important part of the cooling system. A vent at the top of a hay barn is essential: stored hay gets hot - hot enough to burst into flame. The vents let that heat escape out into the air. They also help to keep the barn cool for people. Heat rises, so if there is an opening at the top of a building warm air trapped inside will escape. As that warm air goes out, replacement air has to come in from someplace else. If there is an opening - a door or window - lower down in the building, new, cooler air will flow in. If the vent at the top is smaller than the opening below, the amount of air coming in is greater than the amount that can easily go out. And more air wants to come in behind it! The air going out has to rush making a breeze. In the summer, when the windows are open and the doors to the hay loft are open, a breeze will keep the carriage house, the workmen, and the horses cool.